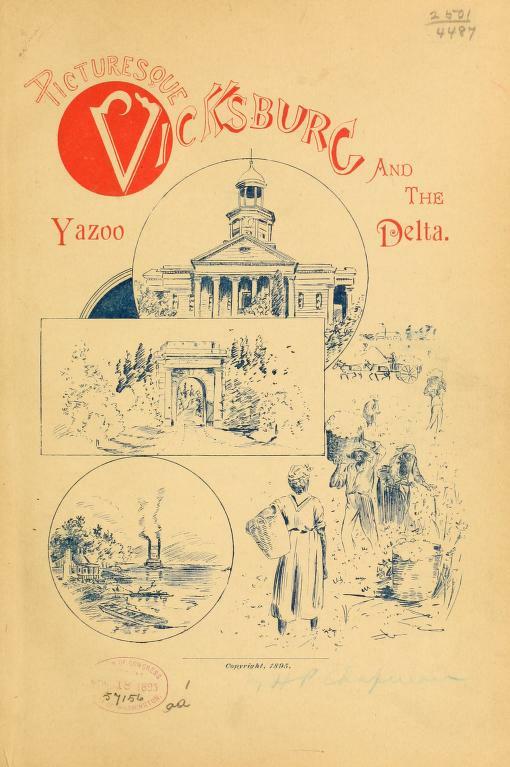 Catching up on my e-mails after my internet-less vacation, I found one from MissPreser Charles Bell, who passed on a link to a booklet I’ve been trying to buy with no success, Picturesque Vicksburg: A Description of the Resources and Prospects of that City and the Famous Yazoo Delta, originally published in 1895 by H.P. Chapman and J.F. Battaile. I’ve kept an eye out for this booklet on my favorite used book site, abebooks.com, but all they have had so far are new Print-On-Demand books, which I shy away from as being less interesting and of lesser quality than the original. Anyway, I can cease my constant searching since the Internet Archive now has a beautiful digital copy that I can access whenever I want and pull photos from easily. The title page boasts that the publication is “Profusely Illustrated,” and this is not false advertising. Many professional photographs and line drawings highlight the text, which provides a useful and interesting perspective on what was then the largest city in Mississippi and the “New Wonderland” of the Delta. 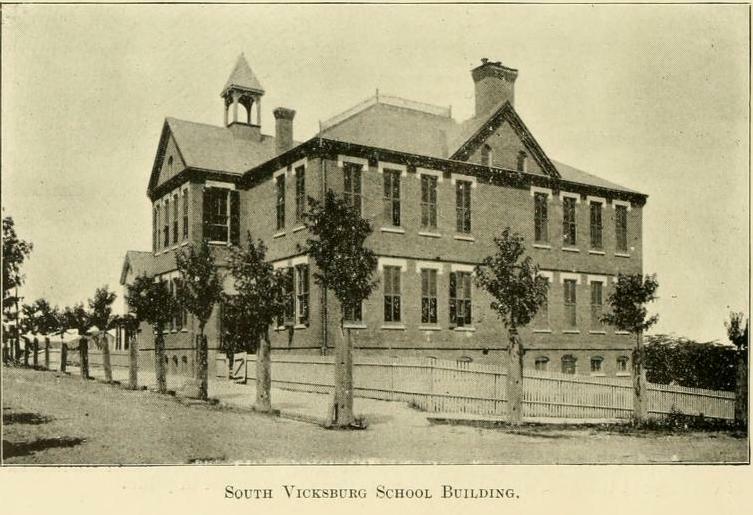 The South Vicksburg School building is a splendidly built brick structure, recently provided, for the convenience and benefit of the southern extension of the city, as well as to enlarge the general facilities of accommodation for the rapidly growing needs of the educable population. This building is arranged for both boys and girls, and is thoroughly equipped with most of the modern improvements (p.95). Or Kuhn Hospital, which began life as the state’s charity hospital? The State Hospital, originally built for a private residence, but remodeled, is on the Jackson road, at the northeastern limits of the city. This institution has an annual endowment of ten thousand dollars, contributed jointly by the city, county, and State, besides a considerable revenue from the Marine hospital service and private patients. It is a well managed institution conducted in accordance with the most improved methods of modern medicine and surgery, and has a capable staff, headed by Chief Surgeon S.D. Robbins and his able assistant Dr. John H. Purnell, who are among the state’s most brilliant medical men. A numerous class of interns assist in caring for the patients, and derive great benefit from the experience thus acquired. The hospital is a handsome brick building with spacious and elevated grounds (p. 90). There’s even a picture of St. John’s Episcopal Church in Lake Washington, built in the 1850s, but already being called a “ruin” in 1895 (page 73), and lots more to see and learn. Thanks to Mr. Bell for sharing this find of his! That’s a great find – and something that I could easily get sucked into reading all day instead of getting work done. As I’ve mentioned before on several occasions, the final list won’t be published until all the polling is complete. We’re about halfway through the polling, with five polls complete and six to go, and my goal is to finish the polling by the end of the year and have a final list to start the new year. I had hoped this list would be a fun exercise, but to be honest, it has become somewhat stressful and is very time-consuming, and since I’m just one person, with a real day job, and with many other events going on in my life, the polling sometimes has to take a break. I’m sorry it’s taking longer than you want. The vicksburg book by Chapman can be found on http://www.abebooks.com for about 25 bucks. Should be easy enough to get if you really want one. Yes, as I mentioned, those are all new print-on-demand books, which some people like, but I don’t, so I’m waiting for an old copy to emerge. I have an original copy that was printed in 1895. It was bound in a hard copy and is in fair condition. I have no idea what the value is but I do know that one of these books was used to help restore the original look where Coca cola was bottled. Thank you for taking the time to answer the questions I had. It is appreciated. 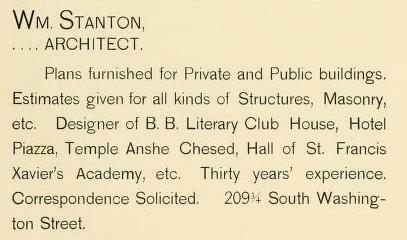 Are any of the buildings mentioned by Stanton in his advertisement still extant? None of them seem particularly familiar, I wonder if they were wantonly destroyed like the South Vicksburg School Building? I believe only the Hall of St. Francis Academy is still standing. The Temple was wantonly destroyed in 1983 (I think Stanton was not the original architect of that building, but of a remodeling). The first B’nai B’rith Club building burned in 1915 and was replaced by the building still standing, and I don’t know much about the Hotel Piazza, other than it was later called the National Park Hotel and it’s now no longer standing.